NORMAN — University of Oklahoma and NASA officials unveiled a new program last week they say will give researchers a better look at where greenhouse gases are concentrated in the atmosphere. The university and the space agency are partnering to develop the Geostationary Carbon Cycle Observatory, or GeoCarb, a scientific observatory that will measure concentrations of carbon dioxide, carbon monoxide and methane in earth's atmosphere and gather information about plant health. The $161 million project represents the largest contract in the university's history. Officials hope to launch the instrument into orbit in June 2022, said Berrien Moore, dean of OU's College of Atmospheric and Geographic Studies. At an unveiling event Wednesday, Moore said the instrument will be placed on a commercial satellite and launched 22,500 miles above the earth. The satellite will be in geostationary orbit, meaning it will remain above the same position above the earth's surface, said Moore, who serves as principal investigator for the project. 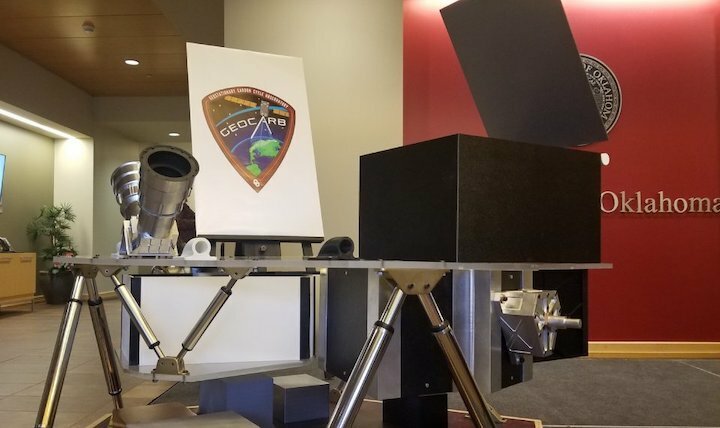 Once in orbit, the instrument will make daily scans of North America and South America and use the color wavelengths coming from the planet to determine concentrations of carbon dioxide, carbon monoxide and methane in the atmosphere above the two continents. The data the instrument collects will give scientists a better view of the relationship between the carbon cycle and weather events like El Nino and La Nina, Moore said. Because the instrument will collect readings daily, it will allow scientists to compare greenhouse gas concentration data against weather data. NASA Administrator Jim Bridenstine said the instrument also will give scientists a more complete look at the sources of carbon, as well as carbon sinks — areas like forests and oceans, which can absorb carbon dioxide from the atmosphere. NASA hopes to use the data to better understand how trends on land, in the oceans and in the atmosphere affect each other. Once the instrument is in orbit, NASA will release the data it collects publicly, meaning it will be available to researchers around the world, Bridenstine said. Placing the instrument on a commercial satellite allows the agency to complete the project at a fraction of the cost it would pay to launch its own satellite, he said. A former Republican congressman from Tulsa, Bridenstine once expressed skepticism about humans' role in climate change. More recently, though, Bridenstine has said his views align with the scientific consensus that climate change is being driven by greenhouse gases that are released into the atmosphere when fossil fuels are burned. At a news conference Tuesday in Oklahoma City, Bridenstine said NASA's role is to collect information that will allow researchers, policymakers and the public better understand the causes and effects of climate change.